Motorola is getting ready for Cyber Monday and like the other players in the tech world, showing the details of deals on the website is quite useful. Currently there are three deals listed on the website and hopefully we can expect to see additional deals in the coming Monday. To start off, the price of Moto X (2nd Gen) 64GB has been slashed by 25% to bring down the final cost to $299 from $399. You can avail this deal from within the Moto Maker, where it lets you customize the device to your preference. Hence, the price might go up depending on the level of customizations. 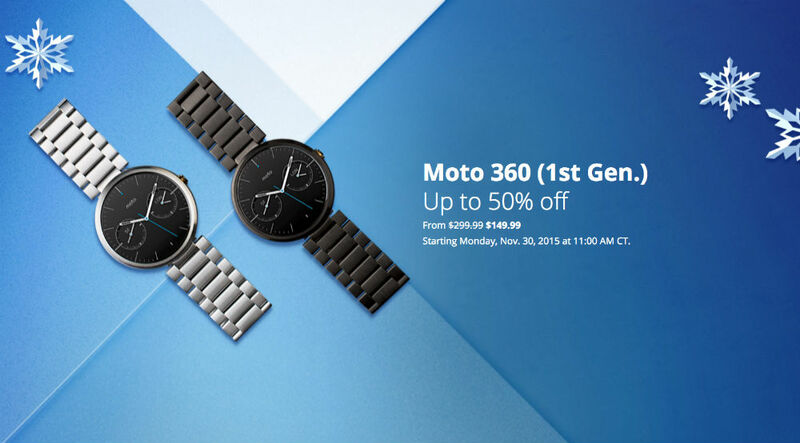 Motorola will also give the Moto 360 (1st Gen) at 50% discount, bringing its price down from $299 to $149. Please take a note that this model is the 1st Gen, and at Amazon, you can purchase this device with variety of models to choose from starting at about $140. We'll say, this deal is not so enticing and definitely doesn't stand out in Cyber Monday history. Finally, those looking to own a Moto G (2nd Gen) can get one for just $99, brought down from $179.99. That's more than 40% discount on the price listed for the phone. Then again, this is the 2nd Gen model, not the 3rd Gen which can bought from Amazon for $170.